This project will analyze, adapt, and test an existing ultra-low frequency (ULF), through-the-earth system for communication and tracking of underground mine personnel. Functional specifications will first be developed for a mine-worthy, commercially viable communication system. These specifications will address, in part, carrier frequency, bandwidth, data format, modes of operation, antenna topology, power requirements, and packaging. An existing through-the-earth communication system used for oil and gas drilling will then be modified to include remote and surface units, appropriated software, and worker-machine interfaces. The redesigned system will be demonstrated in a mining environment. A commercialization plan will be drafted as a guide for marketing this technology. The expected outcome is the modification and operational test of an existing system that can be applied safely in underground coal mines and used during routine as well as emergency situations such as explosions, fires, or water inundations. At a preliminary design review held at NIOSH's Pittsburgh Research Laboratory in March 2009, it was decided to focus efforts on designing a through-the-earth (TTE) communication system which would be based upon electric field sensing. Such an approach would hold promise to extend communication ranges up to 3,000 feet. A new prototype subsurface unit was then constructed. The unit was fitted with a Bluetooth interface that allows a person underground to use a handheld unit, such as a cell phone or a PDA, as the user interface for text messaging to the surface. Underground personnel could carry a small handheld device while working, with the subsurface transceiver being placed nearby (within 100 feet). During June 2009, the primary focus was E-Field Antenna testing with the prototype system. The contractor successfully performed two-way TTE communications at approximately 2,000 feet using practical antenna configurations in limestone rock formations. A key factor in optimizing E-field antennas is minimizing the impedance seen by the transmitter, specifically the electrode contact impedance with the earth. Improved performance was achieved by using multiple ground rod electrodes, or with a buried conductor of some length, such as braid material that has been covered up with soil. Fences with metal conductive posts that are strung with wire conductors were found to be excellent E-field transmit and receive antennas when coupled with the prototype system. The most challenging aspect of implementing the system in a mine is providing an E-field antenna for the subsurface unit that is practical and can be easily installed or accessed. One possibility is the installation of occasional roof bolts with conductive epoxy at regular intervals in the mine. These roof bolts can be connected together with a conductor, such as a conductive braid or wire, or conductive roof mesh. E-Spectrum Technologies traveled to the Pittsburgh Research Laboratory to conduct a Test Readiness Review (TRR) in August 2009. A test of the system took place at NIOSH's Safety Research Coal Mine. 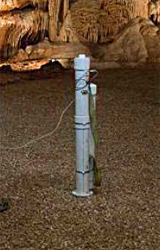 The surface E-field antennas were composed of two 100-ft-long metal braids connected to grounding stakes at five-foot intervals. The subsurface system relied on the infrastructure in the mine. Initially, the subsurface antenna electrodes were composed of one track rail and one roof support brace. Communications were established with the surface at this location with an estimated separation distance of 1,200 feet. After this test, the subsurface unit was moved further in the mine with the separation distance at this point estimated to be about 600 feet. Communications were established using the roof mesh and one track rail as the antenna electrodes.